EOS is a protocol token much like Ethereum, that uses smart contracts and decentralised applications (dApps). EOS underwent the move from ERC-20 tokens to mainnet in July 2018. The token is trying to bring together the most significant features of various other technologies such as the computing support of Ethereum and Bitcoin's security. The EOS vision is to build a platform that provides a smooth experience to app developers, entrepreneurs, and users. EOS is hugely scalable with the ability to do thousands of transactions per second. One of the most recent improvements EOS has made is a database that has access to accounts and stores user data on a local machine off of the blockchain. When an account is compromised, there is a recovery setting with various methods of proving your identity. The EOS network is free to use regarding building apps on the platform meaning that companies and developers are free to come up with their service fees for users. Cloud storage is part of EOS; this means that app developers can build applications and deploy applications and web interfaces with hosting, cloud storage and download bandwidth provided by the EOS system. This opens developers up to bring their ideas into reality free from the demands of securing storage and bandwidth. The EOS project is developed by a company called 'Block One,' run by Dan Larimer (co-founder of both Bitshares and Steemit) and Brendan Bloomer. The EOS team is on track with the roadmap proposed earlier in 2017 and continues to work away at development with high speed. 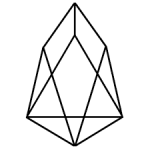 For more information regarding EOS visit the official website. Pay with POLI. It's fast! Please note that you may experience a delay in receiving a custom order for this currency. 9am – 10pm, 7 days.